Click here for a list of all blog topics. Last year the Texas Legislature told the State Board of Education to create new, specific curriculum standards for high school elective courses about the Bible’s influence in history and literature. That was one of a number of safeguards for religious freedom that lawmakers put into the bill. In March, however, the state board decided it wants public schools to continue relying on vague, very general standards that social studies and literature teachers use to craft “independent studies” courses on a variety of topics. The board did so despite the intent of the legislation and despite research from the Texas Freedom Network Education Fund showing that most Texas public schools that already rely on those vague standards end up with Bible classes that are really about the religious views of the teacher. Even worse, students in those classes may even find their own religious beliefs disparaged by the teacher and classroom materials. Sarah Posner, who compiles The American Prospect’s always-informative “The FundamentaList,” a round-up of religious-right stories each week, interviews Jeff Sharlet, an expert on the media’s coverage of religion, about his new book, The Family: The Secret Fundamentalism at the Heart of American Power. The Family exposes the inner workings of an elite and secretive association of politicos (The Family boasts a bipartisan but mostly Republican roster of members, including Sens. Sam Brownback, a Kansas Republican, and Mark Pryer, an Arkansas Democrat) and business executives (such as the CEOs of Continental Oil and the defense contractor Raytheon) who have exploited their uber-masculine, uber-capitalist version of Christianity to serve political and profit-making goals, from union-busting here at home to imperialist adventures abroad. The Family is best known to the public for its annual National Prayer Breakfast, a seemingly innocuous event routinely attended by presidents and members of Congress. Read the interview. Also check out TFN’s report on the National Day of Prayer (.pdf!). Were the Founding Fathers Creationists? Many times we stumble across op-ed pieces that argue in favor of including “intelligent design”/creationism in public school science classes. We usually don’t include them in our Daily News Clips because there are far too many of them and we don’t want to add fuel to their fire. But today is a good day to look at one such column written by Chuck Norris and published yesterday on TownHall.com. Mr. Norris, you will remember is the actor and martial arts expert best known for his role in Walker, Texas Ranger. He is also on the board of the National Council on Bible Curriculum in Public Schools, which hawks a sectarian, error-riddled Bible curriculum to school districts nationwide. In yesterday’s column, Mr. Norris weighs in on the “intelligent design”/creationism controversy. The vast majority of his column consists of statements made by the Founding Fathers. He presents these quotes as evidence that they would be in favor of teaching in science classes that the world was created by a divine being. A Republican Congress instituted the first federally funded private school voucher program, the D.C. Opportunity Scholarship Program, in the District of Columbia in 2004. The program was a political victory for far-right groups and individuals such as voucher sugardaddy James Leininger of Texas. But it looked likely to fade out of existence due to the efforts of the current Democratic-controlled Congress. Yet U.S. Education Secretary Margaret Spellings is doing her darndest to keep it alive. Signed into law by President Bush four years ago, the program is the first to provide federally funded education vouchers to students. It awards up to $7,500 per child for tuition, transportation and fees; in 2007-08 it enabled 1,900 students from the underperforming Washington public school system — the highest total yet — to attend the private or religious schools of their choice. Now, let’s look at what Spellings has to say in favor of the program. Can you believe it’s been 13 years since Cecile Richards, Ann Richards‘ daughter, started the Texas Freedom Network? For 13 years we’ve been fighting — with your invaluable help — to strengthen our public schools, ensure respect for all faiths and keep the government from infringing on religion and vice versa. 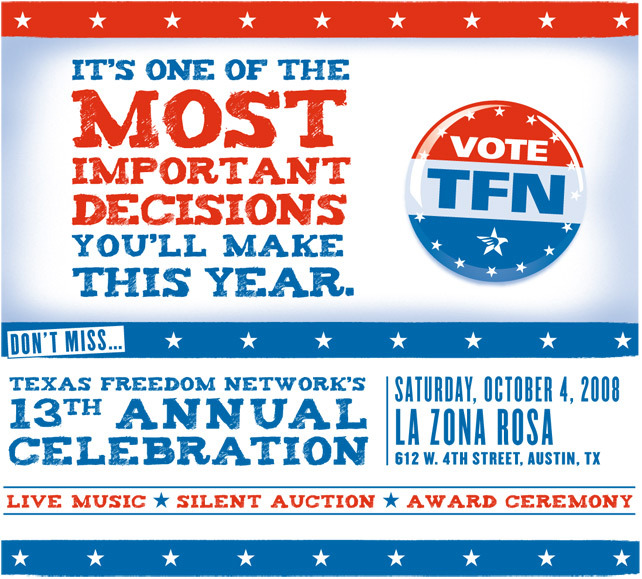 To celebrate, we invite you to our 13th Annual Celebration in Austin — a celebration of freedom and public service. Get your tickets today. It’s one of the most important decisions you’ll make this year.